Extraordinary information has come to light that perhaps goes some way to explaining the vicious EU and corporate media backlash against Hungarian Prime Minister, Viktor Orban, for his “nationalist” policies regarding the influx of refugees from various nations that have been targeted by the predatory interventionist alliance of the US, EU, UK, Turkey, Gulf States, Israel, Canada, Australia, Jordan and other smaller players. “Hungary does not need a single migrant for the economy to work, or the population to sustain itself, or for the country to have a future,” he told a joint press conference in Budapest with Austrian chancellor Christian Kern. “This is why there is no need for a common European migration policy: whoever needs migrants can take them, but don’t force them on us, we don’t need them,” Orban said. The populist leader added that “every single migrant poses a public security and terror risk”. Mr. Orban, who has ordered border fences built to stop migrants, said that the ideas of the “upstanding American presidential candidate” about the need for the best intelligence services and his opposition to “democracy export” were also applicable in Europe. 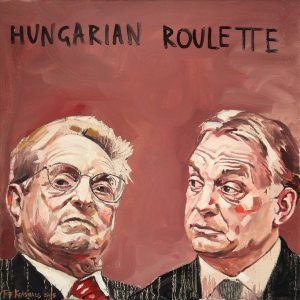 Then, according to a report in Bloomberg today, Orban has gone one step further and ordered a crack-down on all NGOs linked to billionaire George Soros, convicted criminal hedge-fund manager & vociferous supporter of the EU opening its borders to refugees. Soros is also the anti-Syria campaign impresario, funding and supporting a vast array of anti Syria NGOs operating in lock-step with Washington’s “regime change” objectives in Syria. Hungary plans to crack down on non-governmental organizations linked to billionaire George Soros now that Donald Trump will occupy the White House, according to the deputy head of Prime Minister Viktor Orban’s party. The European Union member will use “all the tools at its disposal” to “sweep out” NGOs funded by the Hungarian-born financier, which “serve global capitalists and back political correctness over national governments,” Szilard Nemeth, a vice president of the ruling Fidesz party, told reporters on Tuesday. No one answered the phone at the Open Society Institute in Budapest when Bloomberg News called outside business hours. Orban and his administration have frequently singled out NGOs supported by Soros, a U.S. Democratic Party supporter with a wide network of organizations that promote democracy in formerly communist eastern Europe. So, for Hungary, its “bye bye, Soros”. The U.S. and China: Why the Sudden Convergence on North Korea?